Did you know that Breast cancer becomes one of the most common cancer types in women? It is believed that about 246,660 new cases of invasive breast cancer will be diagnosed by the end of this year in America only, and over 40,450 women will die from it. Actually, these numbers should just remind us that we need to be informed about this issue and be able to prevent it actively. In order to be able to prevent or treat cancer, if diagnosed in its early stages, you need to know the symptoms and signs. - A cancer that starts in one area is known as the primary cancer. If some cancer cells break away from the primary cancer and move on to another part of the body, they can form another tumor, called secondary cancer. Note: Cancer spreads to the lungs in 60-70% of women who become terminally ill from breast cancer. The most common signs are shortness of breath and dry cough. - While moles are more commonly associated with a higher risk of skin cancer, they may also be linked to breast cancer. Note: Researchers found that the women who had the most moles out of the group had a 13% higher risk of breast cancer than women who had no moles. - Fatigue is a common symptom in breast cancer patients and survivors, but it’s also often present before diagnosis. Fatigue from cancer is not alleviated by sleep or rest. It’s typically very severe and often associated with high levels of distress, unrelated to amount of exertion. Note: Cancer-related fatigue is often accompanied by other symptoms such as pain, sleepdisturbance and depression. Researchers believed this fatigue is caused by an imbalance of chemicals in the body which the cancer creates. - Back pain is a common medical problem — so common that 8 out of 10 people will experience it at some point in lives. Back pain can also be a sign that breast cancer tumors are forming. Note: Back pain associated with breast cancer may feel like pressure on the ribs and spine, or pain in the upper back that feels like it’s coming from the bones. - Breast cancer can cause hormonal changes that dry out the urethra, and make it difficult to control the bladder. Note: This is known as incontinence, and common signs include leaking urine during activities such as coughing, laughing, sneezing or exercising,experiencing sudden and urgent needs to urinate, and urination that takes longer than usual. 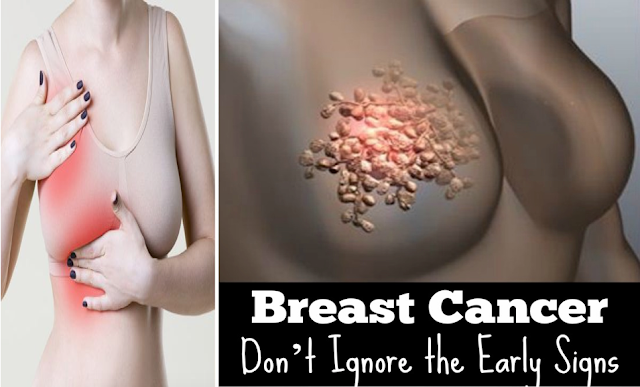 You can watch the video below for information on how to reduce risk of breast cancer.